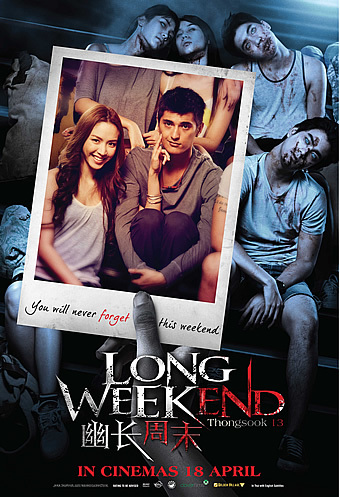 'Thongsook 13' is the original tittle of the movie but it was later being called as 'Long Weekend'. Yup, this is a Thai movie with the genre of horror/thriller/drama which is my utmost favourite when selecting which movie that i wanna watch at the cinema. indeed, a Thai's horror movie is always the scariest thing on the earth! Thongsook is actually the name of the main character who has a crush on the female lead named as Nam. he is mentally sick which made his character a bit childish, he is also able to see ghost through his naked eyes and he is really close with Nam which made the other four characters (Boy, Jack, Beam and Pui) annoyed and hated him. So, the four of them had plan an overnight vacation at an island. they forced Nam to keep the planning from Thongsook. unfortunately, Thongsook secretly know the plan and had reached the island before them. so, they don't have any choice to just accept the surprise as the boat will only come to fetch them after the next 2 days! The local believe that the abandoned island is a haunted one since once upon a time, a ritual of a ghost feeding messily failed that killed all the involved monks and the spirits have conquered the place. the five of them refused to believe the rumor as they still choose to vacay and even joking around at the temple that believe to be the most haunted place on the island. Both of Jack and Boy were harshly bullying Thongsook until they reached the climax when they forcibly locked Thongsook in the temple that suddenly cannot be unlocked. they were panicked and decided to go back home and find anything that could be the rescue tools. once they got home, they were all drunk and totally forgot about Thongsook. yup, something was happened at Thongsook which nobody knows what was it! As usual, one by one of the character is died and until the end of the movie when Nam is the only one who is saved. HAHAHA...but you are seriously need to watch it by yourself if you really wanna know what is the exact ending of this movie. yup, you will never forget this weekend!! Next, would be the rambling on the gorgeous actors. Oh oh, the male actors who played Thongsook and Boy are seriously HOT and SPICY! haha...although the character of Thongsook is abnormal and when he turned into a ghost, he became damn creepy but still he is so so handsome. haha..i have another crush on CHINAWUT INDRACUSIN who played the Thongsook very well. besides, i also got a girl crush on Nam who is damn pretty! Lastly, for the not-a-fan of the hottest ranking IP Man like me...hahahha go and watch this horror movie as i'd rank 'Long Weekend' as 4.0 out 5.0 sizzling stars. yup, another great ghost story from Thailand!